Today I rediscovered a little piece of myself, age seven. This entire week, I’ve been distracted at work. 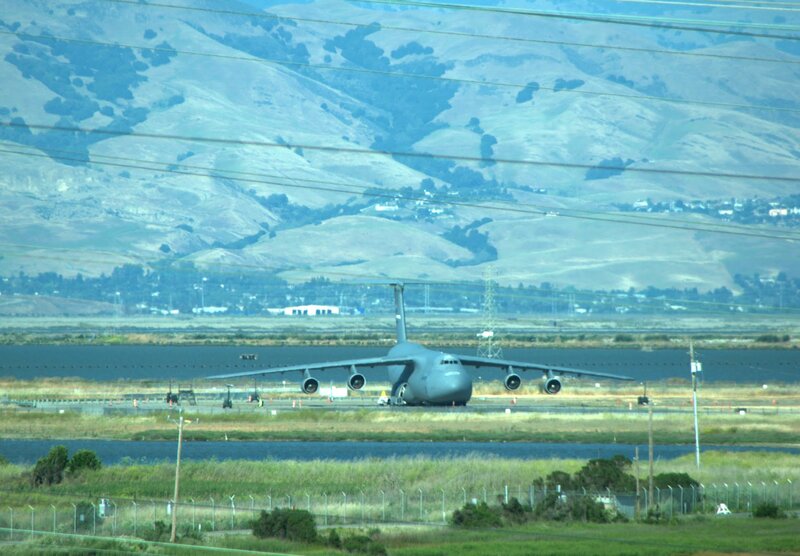 The reason for this is a gorgeous C-5 Galaxy strategic airlifter parked in front of my office window. I’m lucky enough to have a view direct onto the landing strip at Moffett Airfield, a military airfield in Mountain View, shared by the Air National Guard, NASA, and a few other federal departments. The C-5 is one of the largest aircraft, mainly used by the United States government, to deliver supplies and troops across the world. It’s a marvelous sight to behold, and I’ve noticed everywhere in the office there’s a buzz about, wondering “what the friendly giant is doing here”, this time. These are some of the times when Google is perhaps the most fantastic place to work. We’re all geeks here, and almost everyone has their own stories, questions and theories about what makes these giant planes, and their pilots, tick. I am particularly lucky, as my manager is a pilot instructor, and several of my colleagues are experienced pilots, so the stories I get to hear when we’re all watching the planes are some of the best around. Perhaps the most frustrating of this experience is that the Galaxy has not actually moved since we noticed it Monday morning. We’re all waiting in eager anticipation for it to take off, and I may even install a radio scanner tomorrow morning so I get to track the control tower. In the meanwhile, my anticipation made me do with videos of similar planes accidentally landing at a small commuter airport, dropping paratroopers from the sky, or making spectacular landings on sand in the desert. Sadly, I also watched a video of a C-17 making too strong a turn, stalling, losing air speed and crashing at an Alaskan air force base. These great machines can lead to thrilling moments, but when things are not exactly right and under control, also very sad ones. That particular video brought me back to when I was seven years old. I got a very hollow feeling in my stomach, that goes beyond being concerned, worried and shocked. It’s a sense of loss of control, a sense of eagerness to understand what happened, and I never understood why this feeling was so visceral. While I’m anything but interested in war machinery, there has always been one exception. I’ve always been fascinated with aircraft, especially military ones. Perhaps because they are just so advanced, the ways they are being used in harsh and unwelcoming environments, or simply the feeling they create of being able to go anywhere. Some of the most amazing moments I’ve had in the last few years have been related to planes. In 2002, during a flight from Chicago to Las Vegas, on my very first trip to the US, my airplane had to make a sharp turn to evade a fighter aircraft heading in our direction. Looking out the window, we could see it over what looked like right next to the window. Just two years later, together with a friend, I was on a road trip in California. We left the car on top of a ridge, and headed to a viewpoint, just in time to see a fighter fly shoot straight up from the bottom of a canyon floor, heading right towards the sky. In 2009, I was sitting on a tree stump in front of my tent at a lake in the Central Cascades when three jets flew low and fast over Snoqualmie Pass, as if they were trying to impress the cars below them. 2011, on a similar trip, I set up my tent right next to the landing strip at Holloman Air Force Base in New Mexico, watching fighters perform their acrobatics in the sky above me, and landing right next to me, for much of a sunny Sunday afternoon. When I then finally left Washington for California, I was driving my car on a deserted highway amid dense rain and serious winds in hilly Eastern Washington, near Yakima, when three Black Hawk helicopters faded out of the fog, and hovered right above me, a strange sense of surprise and recognition between my little, lone car, and them, dragons in the sky. And here I am, today, working with a view of Air National Guard helicopter exercises, and sometimes even seeing a Russian Antonov An-124 supply satellite parts to NASA. I even got to see the space shuttle do its last flyby, right over the strip. I’m a lucky guy, with this view. Back to when I was seven, though. July 4th, 1989, was the first time I felt the hollow feeling I described earlier. Or perhaps more so, the day after, when I read the newspaper article, and tried to understand what had happened. That day, Colonel Nikolai Skuridin, a pilot in the Russian army, took off in a MiG-29 from an airbase in Poland. Shortly after take-off, he experienced severe issues with his afterburner, pointed his plane towards the Baltic Sea, and per the normal protocol, ejected. Shortly after, though, his engines re-engaged, and on automatic pilot, the plane continued for close to a thousand miles, crossing Germany, the Netherlands, and, finally, Belgium. After crossing into allied territory, NATO radar picked up the plane, and scrambled two American F15’s from an air base in the Netherlands, on an intercept mission. Given the Soviet Union was slowly decomposing, NATO did not know whether this was an attack, or perhaps even a defection. When they finally found the plane, after much internal confusion, the American jet pilots noticed that the plane did not have a pilot, and was unmanned. This state would later be referred to by the Belgian media as a “ghost plane”. There was some confusion on whether the MiG may have had nuclear weapons on board -the popular scare of the day- and thus the authorities decided to not shoot down the plane while flying over densely populated areas. With a population density of 359 people per square kilometer, Belgium definitely is one of those areas, and as the plane was approaching the city of Lille in France, no action would be taken until it was over the North Sea. However, it never came to that. The MiG ran out of fuel, and watched by the two American fighters, crashed into a house in Bellegem, a municipality of Kortrijk. One 18 year old student, who had just finished his final exams, was sleeping in the house, while his mom and brother had gone shopping, and sadly, was killed. Diplomatic furore ensued. Belgium refused to hand the MiG remains to either America or Russia, until damages were paid for. Russia paid a significant amount of money to compensate for the damages, and was able to retrieve the remnants of its plane. According to the media, the pilot of the MiG also personally apologized to the family of the victim, in a written note. This had happened such a long time ago, that it was no longer an active memory. I recall very clearly having the same hollow feeling in my stomach the day I read the news reports of the incident. I recall not being able to come to terms with the fact that an airplane traveled, without a pilot, for a thousand miles, and could come down on a simple house in rural Belgium. I recall seeing a photo of an airline pilot flying a MiG, a map in the newspaper explaining the plane’s travel route, and how alien all of this felt to me. As a seven year old, I did not understand. I do remember asking my father, and learning that “ghost” was an analogy for “absent”, whether it’s a MiG, or simply a car driving down the wrong way of a one-way street. The feeling of not having control over this “ghost” coming from the sky haunted me. Perhaps that’s why these planes continue to so fascinate me.